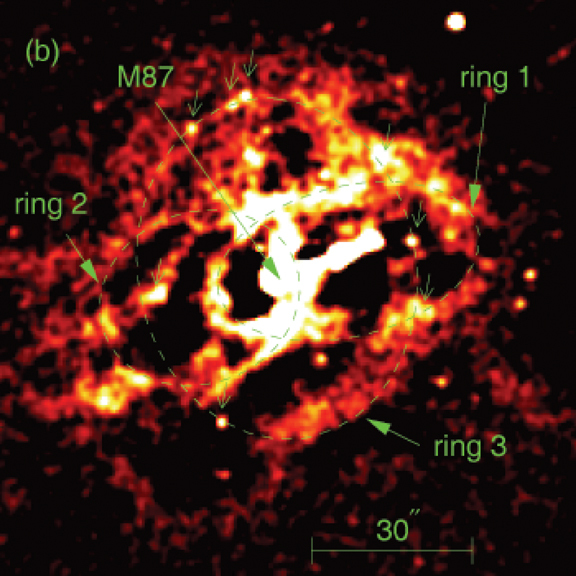 Scientists have specially processed Chandra's X-ray data of M87 to reveal the presence of what they believe to be three rings associated with the galaxy's core and jet. One possible explanation for the triple-ring structure is the merger of two spinning, supermassive black holes. Scale: About 2 arcmin per side. This Chandra image of M87 shows a central jet surrounded by nearby bright arcs and dark cavities in the multimillion degree Celsius atmosphere. M87 is a giant elliptical galaxy in the Virgo galaxy cluster about 50 million light years from Earth.